In another Collections through Cake installment, this time we are joing up with The Art Fund's national fund-raising endeavour #EdibleMasterpieces. One of the amazing roles that the Art Fund has is to help museums and galleries buy art. Recent Leeds Museums & Galleries aquisitions that have been supported by the Art Fund can be found here. They include the West Yorkshire Hoard, 'A Dead Linnet' by John Atkinson Grimshaw and many other wonderful artworks. Here in Leeds, we have a collection of Decorative Art that has been designated as a collection of national importance. To highlight it and the collections that are held at Temple Newsam and Lotherton Hall, we put together a Facebook album from which people could vote for an Art Fund donated Masterpiece to become Edible from! 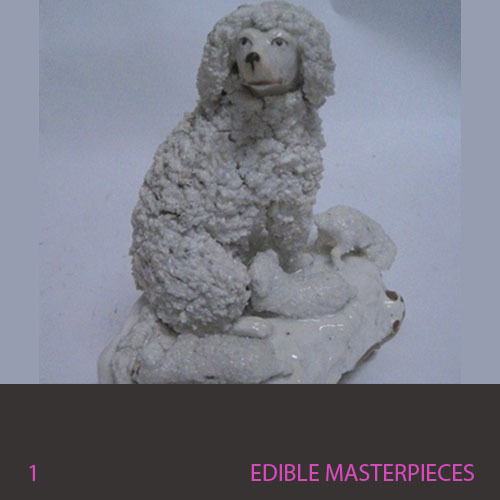 Choices included the Queen Anne State Bed, a Chippendale desk, but the winner was a Rockingham Pottery Poodle. The Rockingham Pottery produced this ceramic in about 1830 - this was close to the end of what was called the 'red-mark' period of Rockingham ceramic production. (The other is the 'puce-mark period' from 1831-42.) These names reflect the colour of the stamp on the piece. 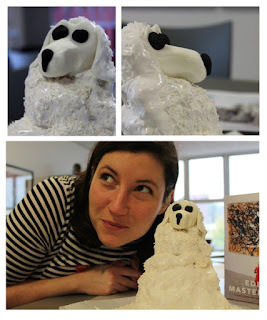 Projects Curator Lucy got to make the bake! Our lovely poodle (and puppies) is made out of raspberry buttermilk sponge, with coconut buttercream sandwiching the layers. The shaggy coat is made from marshmallow, with glittery sprinkles and a bit more coconut. A hand-sculpted face completes the masterpiece. Expressions are all the poodle’s own. Interestingly, Rockingham got the effect for the poodle's coat by attaching very small pieces of ceramic one at a time to create a ruffled effect. Lucy used marshmallow and dessicated coconut to achieve the same ends. Lucy says: I made the bake the evening before, then this morning sandwiched the layers and ‘iced’ the cake. I had a surprise as marshmallow is not perhaps the best medium to create a poodle’s ceramic coat from - it's sticky – there were a few moments where I thought “this isn’t working”!